Give me more power ! Low current consumption was one of the main objectives when the panStamp firmware stack was originally designed. For this reason, transmission power was hardcoded to something around 2-3 dBm, that corresponds to 17-19 mA in Tx mode. Subsequent tests showed that this configuration guaranteed more than 200 m (656 ft) of transmission lengths in open spaces using a simple 1/4 wavelength wire antenna. I even checked communications in some multi-story houses without problems, even in presence of thick walls and metal doors. However some people is asking about the possibility of maximizing transmission power in certain applications. Well, you know that placing a better/longer antenna should achieve longer distances but this is not always possible due to space or cost reasons. Thus, I've added a couple of macros in the panStamp API that will let us switch between low and high Tx power. Just note that in the absence of setHighTxPower and setLowTxPower our "Low power" mode is taken by default. 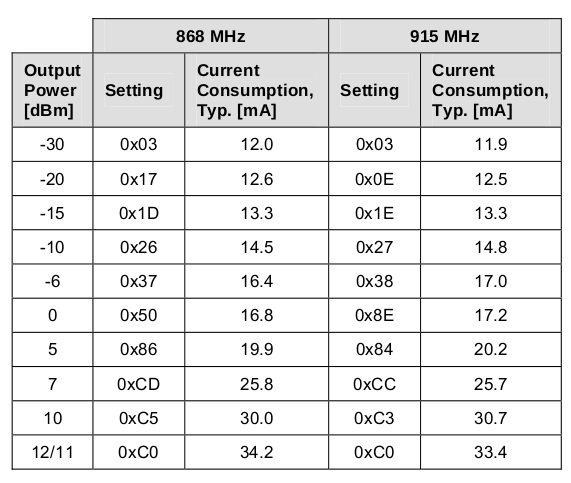 Our "low power" mode sets PATABLE to 0x60 whilst the "high power" mode sets it to 0xC0 (33-35 mA). It is still possible to set different values, modes and Tx power management strategies by modifying the panStamp library.